Well this week, Daddy and G got sick but again, we were able to do a lot this week despite the sicknesses in the house. Playdoh has become a mainstay in our homeschool day! This week, we decided to dedicate some of our week to teach the boys about giving. 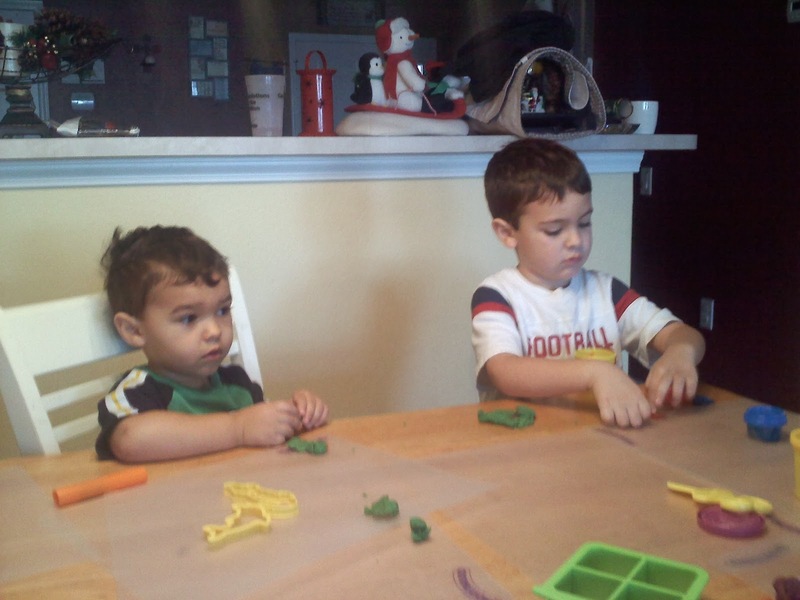 This is the boys getting all of our ingredients together for Christmas gifts for Awanas teachers. Awana's verse this week - "Today in the town of David, A Savior has been born to you; He is Christ the Lord." Luke 2:11. We also read Matthew 1:18-25, Luke 1:26-38, 2:1-20. Chapter 28 "The Holy Spirit" Acts 2 - The Holy Spirit came in a whirlwind and a flame of fire came over the disciples and they learned different languages they had never known so they could go and tell others about Jesus. We explained that the Holy Spirit is the love and belief we have in Jesus. 3,000 people were baptized that day! 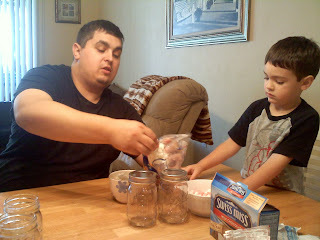 Daddy joined in to help teach the boys about equal measurements so good math lesson while giving! I found this idea on Pinterest so I decided to call it Snowman Cocoa to go along with our snowman lesson on number 3 this week. 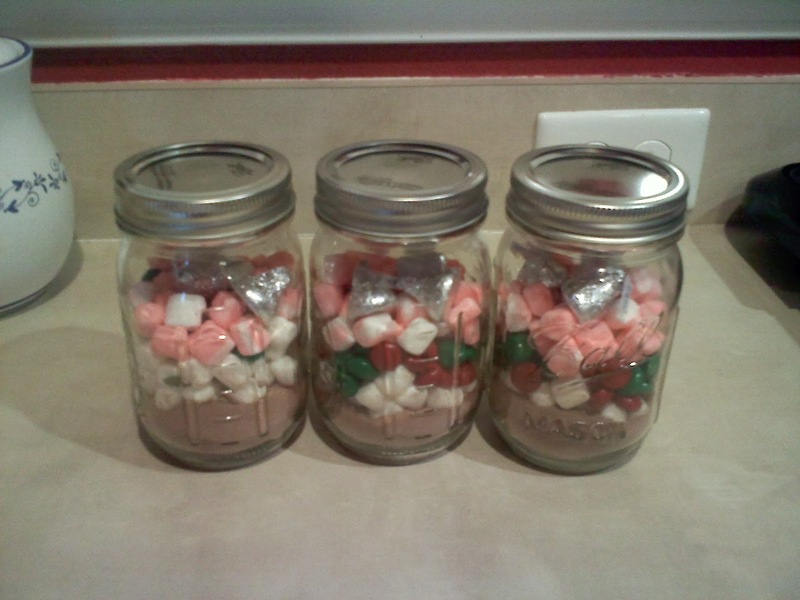 You put a layer on cocoa, then there is white mini marshmallows, red and green M&Ms, pink peppermint mini marshmallows and then some Hershey kisses to top it all off in a mason jar! 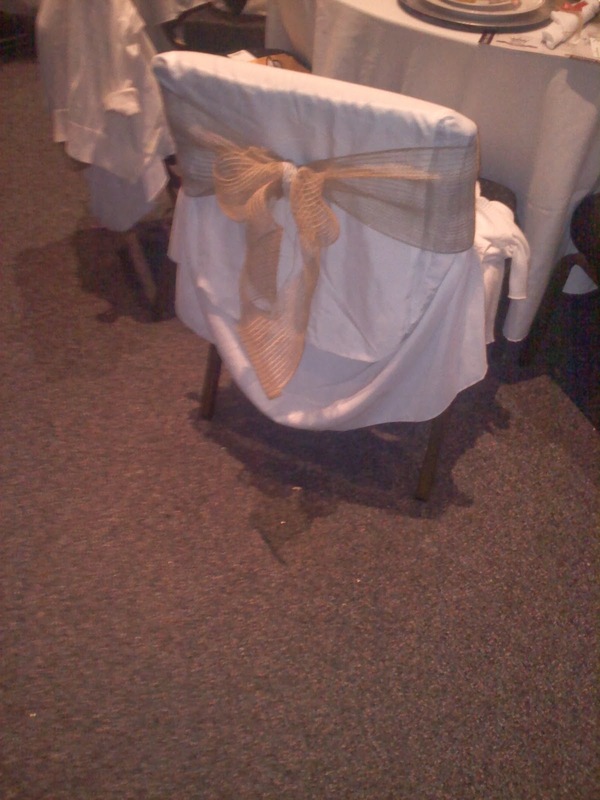 We put a bow on top and it came out really nice! 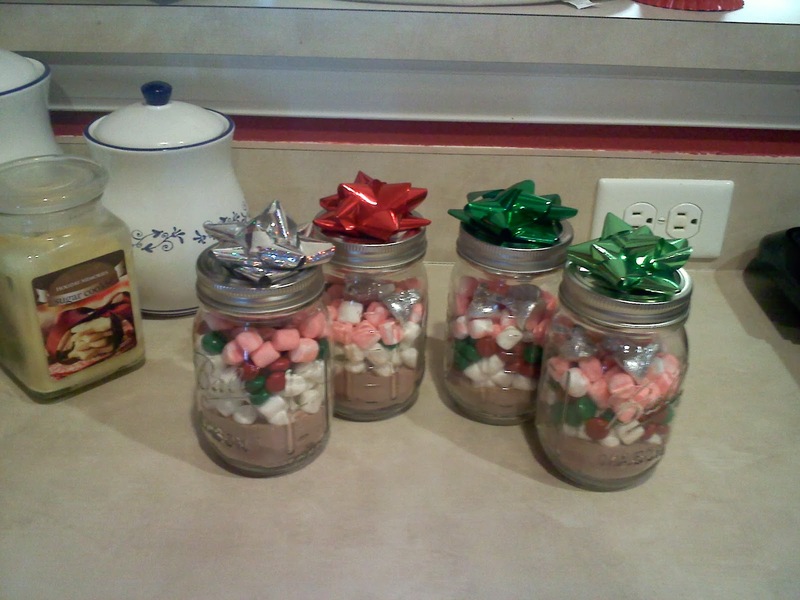 B talked about this at Awanas with his teachers about him and his Momma making powder and marshmallows for presents for them and then I came to pick him up and it all made sense at that point for his teachers! They loved the Snowman cocoa! 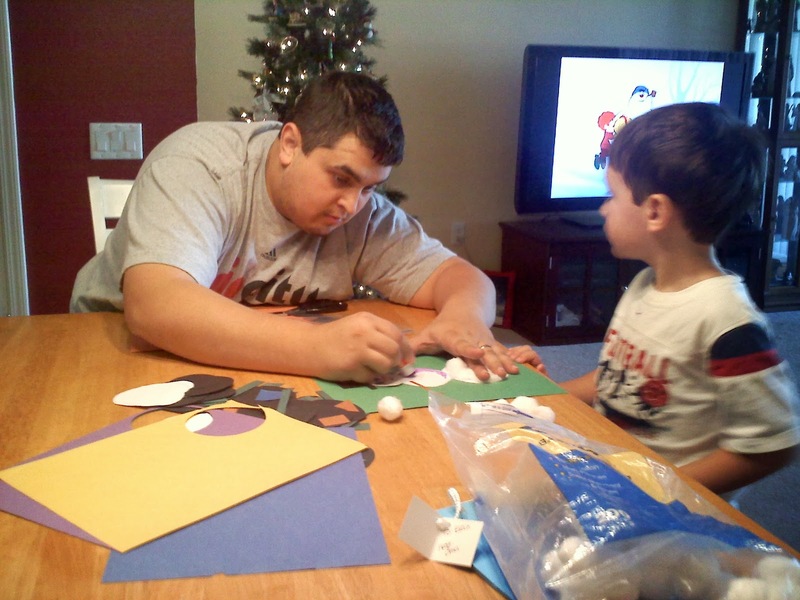 G getting his snowman prepped. 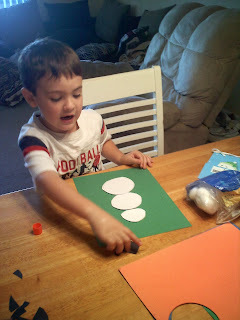 We did 3 circles out of construction paper and then covered it with cotton. Daddy home from work sick so he got to help with homeschool this week! 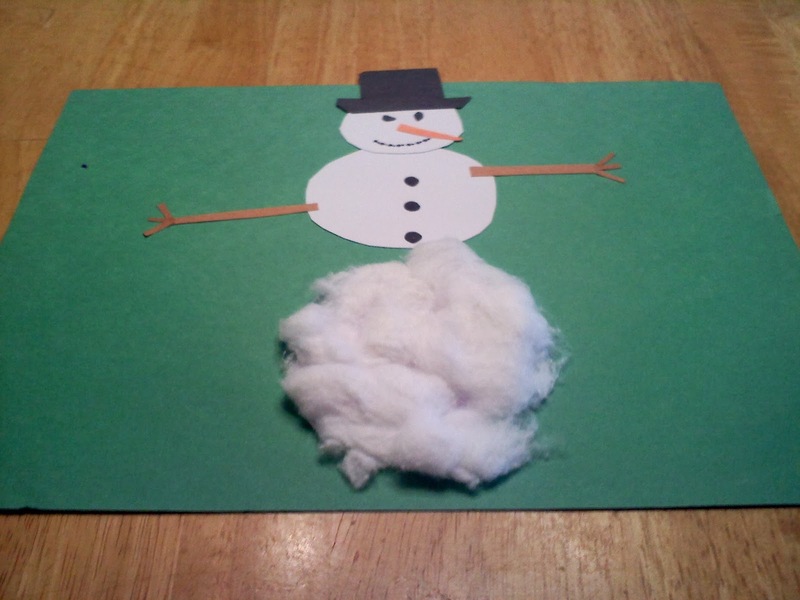 He always gets to be home for the cool projects :) We built a snowman with 3 circles for its head, body and bottom and the snowman had 3 fingers on each hand to go over our lesson for 3 this week. ABCmouse even covered #3 this week, which was awesome! 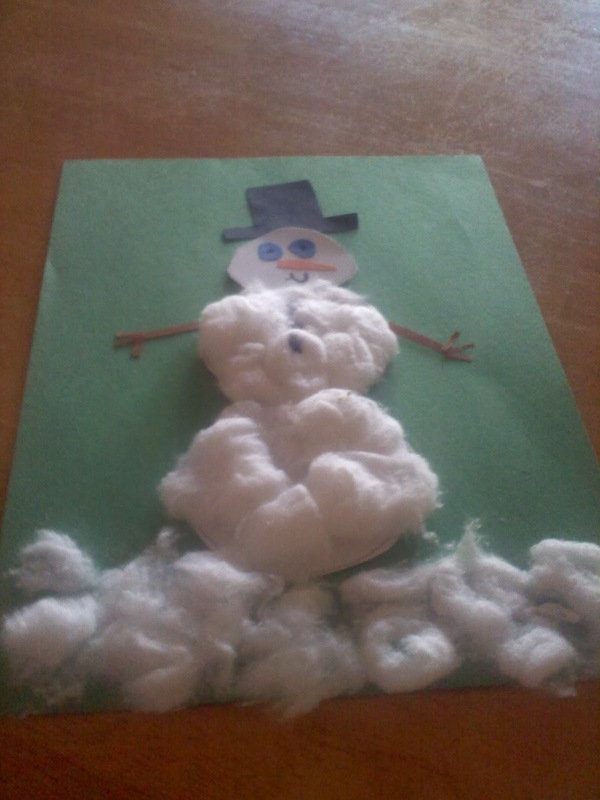 B's Frosty the Snowman. We even watched Frosty the Snowman the movie after we were done! 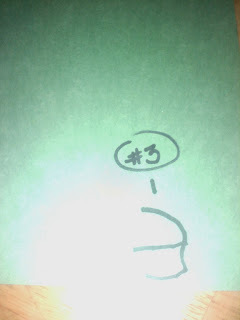 B's writing for # 3. 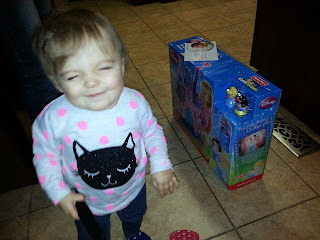 We sent her a birthday gift and this is her opening the box! She lives in another state as does my brother's daughter but its cool to be able to see the pictures of them growing since I can't be there. But we will be visiting next year and the boys will get to go Trick or Treating with them so I am looking forward to that! 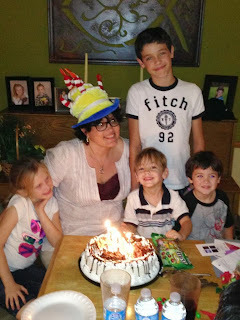 This picture was Grandma's birthday 2 weeks ago! phonetic awareness on ABCmouse - matching pictures to beginning sound letters. We read "Curious Critters" this week and learned about different types of critters like fireflies, Gila monster, frogs, toads, Ohio crawfish, Blue Jay, Monarch, Fox Snake, Eastern Screech-Owl, beetles, praying mantis, turtles). We also were read an ebook on Elephants on ABCmouse. 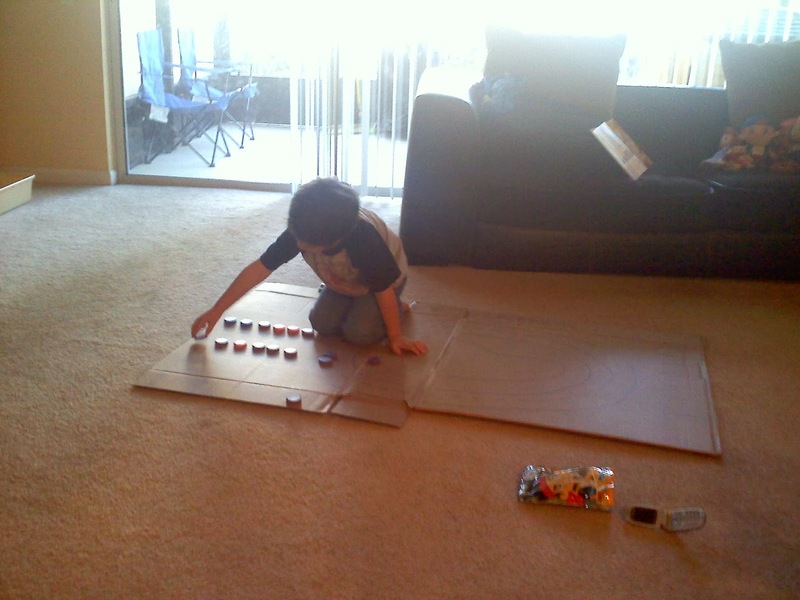 Awanas, playdate with friend, and gluing all the correct items in the right spot for the Frosty art project. There was also color matching on ABCmouse and matching letter F to the correct picture. 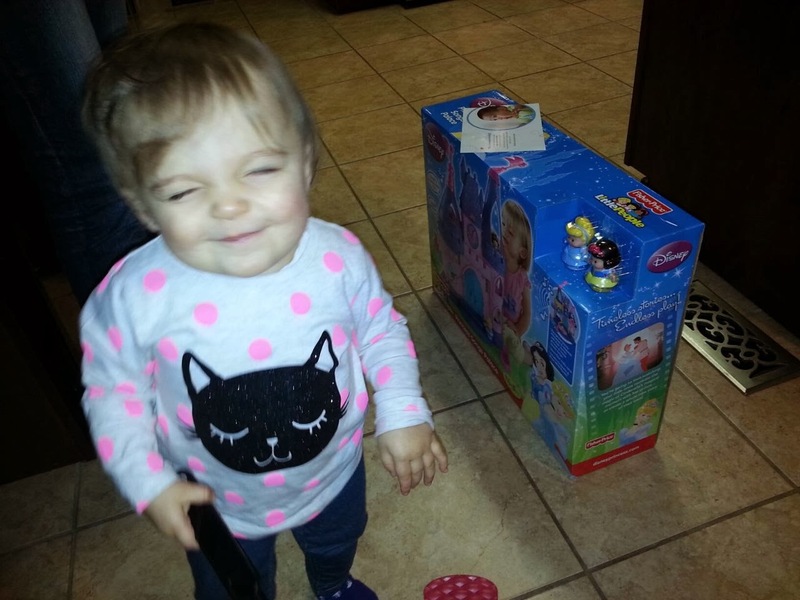 Week of December 9: Started with numbers 1 and 2! 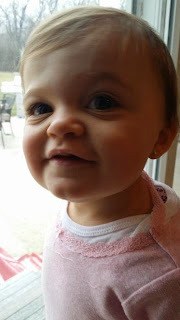 Momma had a few sick days this week but amazingly we were able to get through a full week! Here are our adventures this week! I had a great talk with B this week. He asks me like this, "So, Mom, this star of Bethlehem can you tell me about it?" Yes, just like that! I explained about the three Kings and how the star lead them to baby Jesus who was born in a manger and how Christmas is so special because it is His birthday and how He came to save us from sin. We actually had a long, intellectual conversation about all of this and I am so proud of him for wanting to know about our Lord and Savior. We went over that Jesus is God's Son and how Jesus died on the cross for our sins so we can live in heaven with Him one day and how it is good to be good. 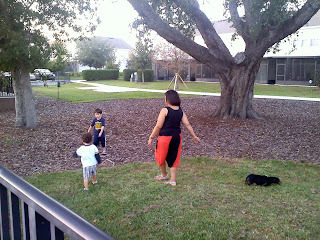 Chippey saving Wendy from Captain Hook with Peter Pan, Jake, and Cubby! 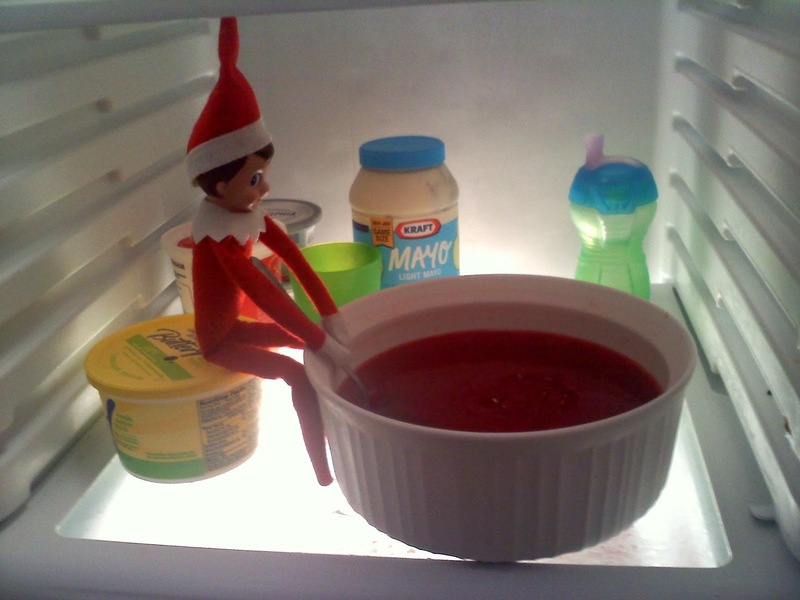 Chippey eating the jello Daddy made the night before! 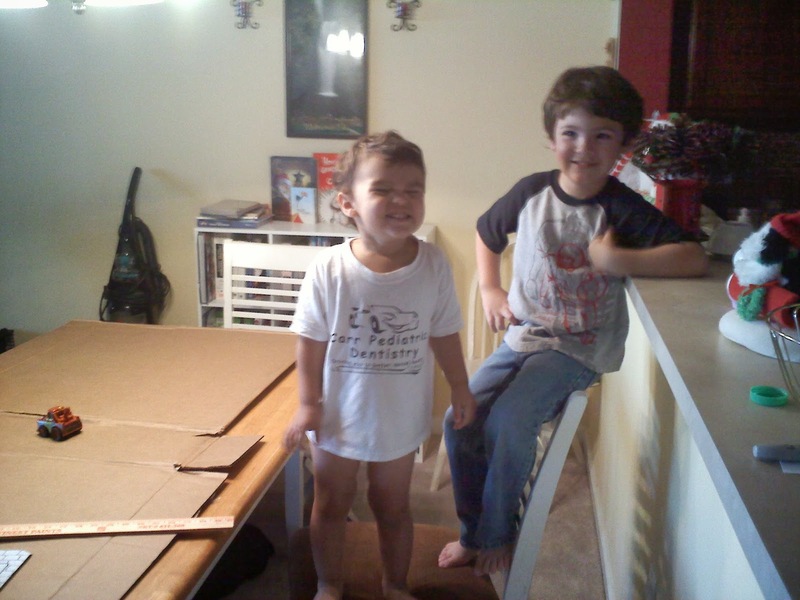 We borrowed this idea from the boys' Aunt! Thank you! 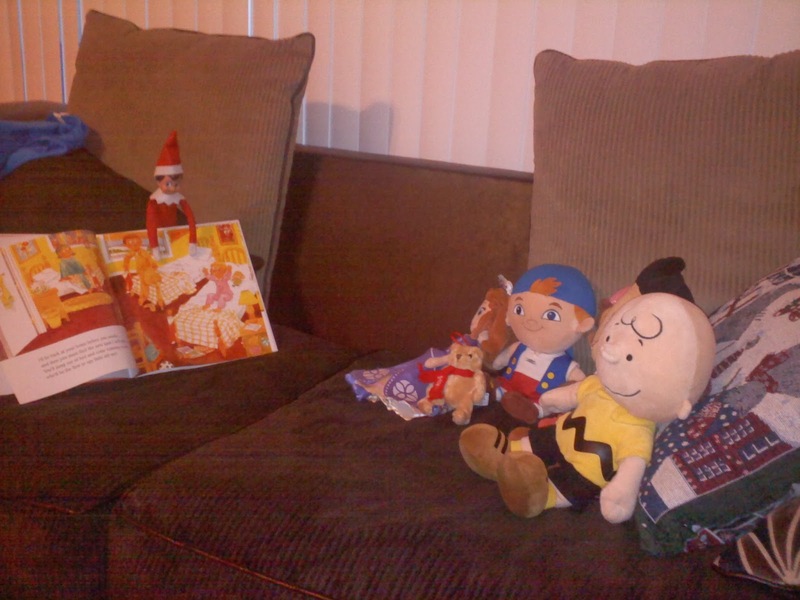 Chippey reading his book to the stuffed animals or "buds" as the boys call them! 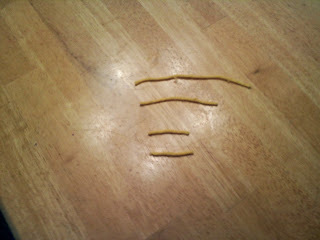 We made a racetrack called "Reading Street Speedway." I saw this idea on Pinterest (http://www.themeasuredmom.com/free-word-family-houses-short-e/) a few months ago and combined different ideas from there all together on this project! The circles are for the top of milk gallon jugs that I wrote letters on so B can practice his spelling and G to know his letters. B also said we needed a parking garage so we made that and the windows of the garage will hold the flash cards with the words on them! On the other side is parking spots for them to spell the word first and then race the car over to the spot where either a flash card will be or an item that the word they spelt stands for. 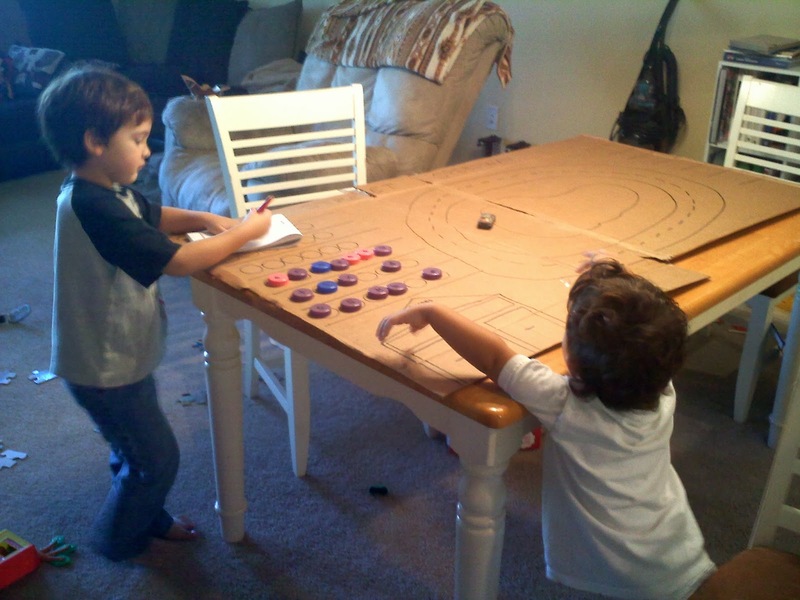 They had a blast putting all the letters on the board and then racing their toy cars around the race track! 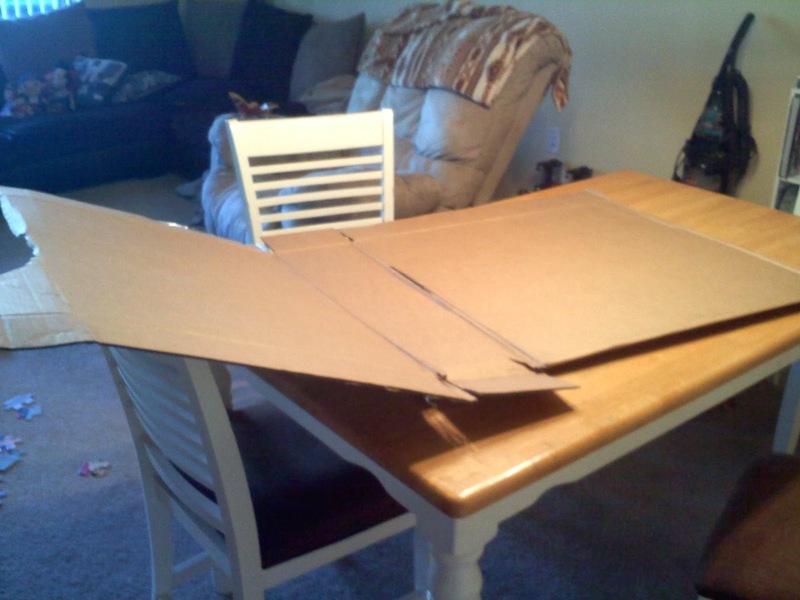 It's a huge piece of cardboard but it folds so it can get tucked away! 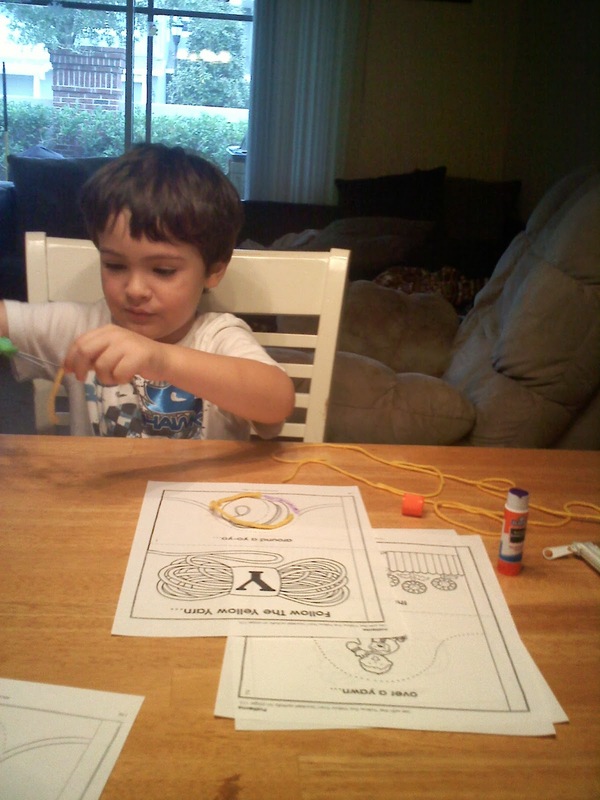 Here B is working on his spelling and reading his sight words! I think it's awesome they can have fun and still learn! 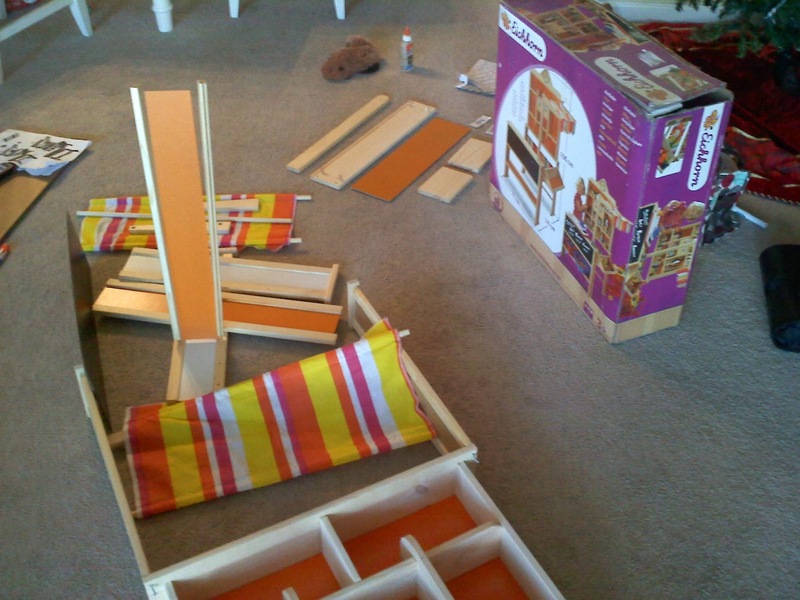 After we were done, B suggested we make a castle on the other side for next week! My Mom bought this grocery shop set for the boys for Christmas from her frequent flyer miles and it's from Germany! The boys love playing with the grocery section at the children's museums so when I saw this on the website, I said that would go over big! 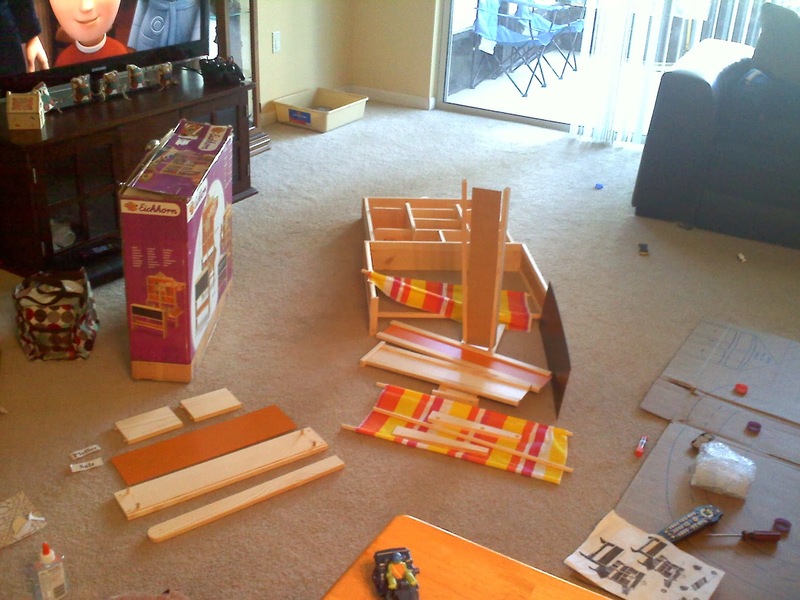 When we got it this week though, it was missing several pieces so we couldn't put it together. I contacted the manufacturer in Germany and they said for me to take pictures so that they could send me the missing parts so they boys and I had to semi-assemble this to do that. The good news is we did such a great job with the pictures that they are sending us a brand new set absolutely free! That's customer service! 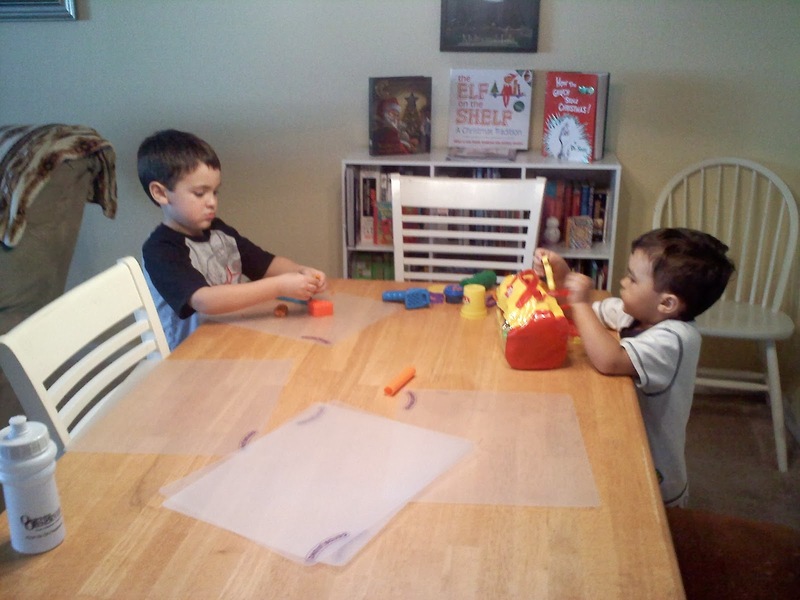 The company is called Eicchorn and they have amazing, quality educational and fun products and I would highly recommend them! They were extremely considerate and professional with me! Chippey must have loved our creation! 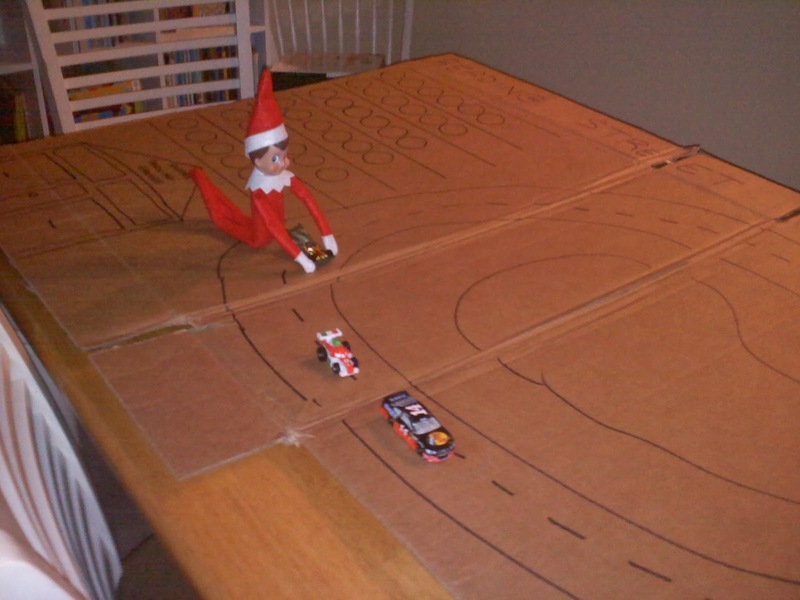 Here he is racing cars on the track! 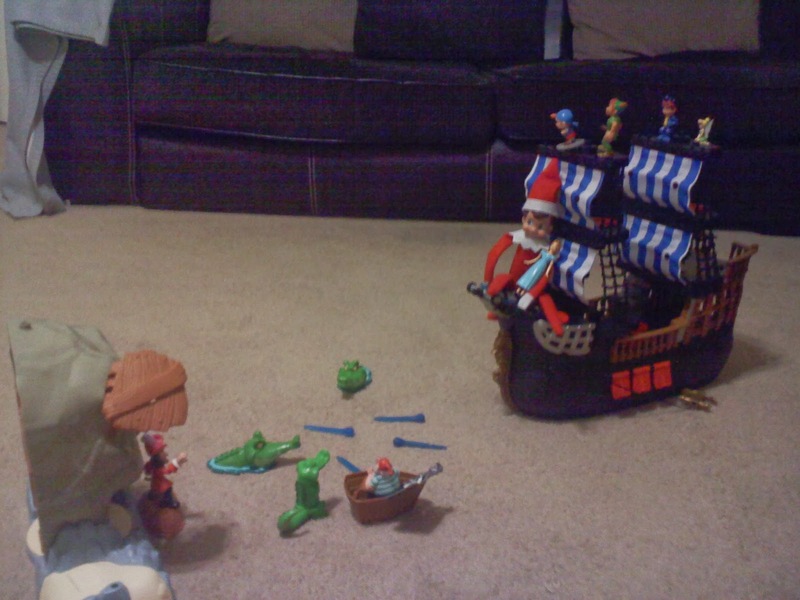 B snapped this awesome pic of his brother finding Chippey in the morning! 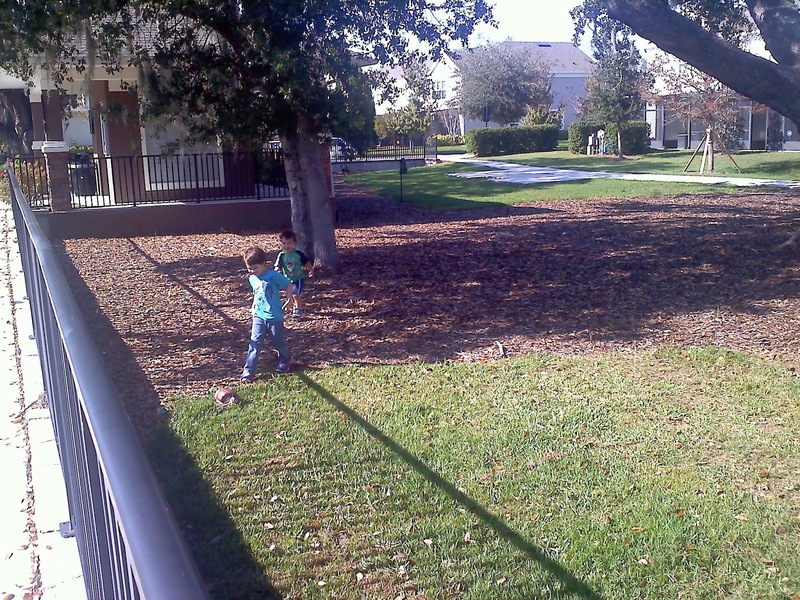 The boys and I out got out and about this week with some walks and playing football! 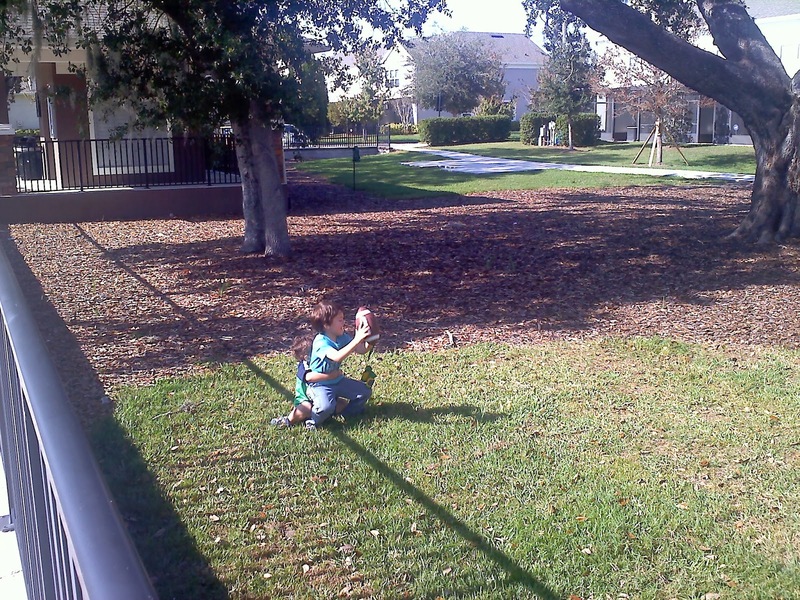 I didn't last for too long because of me being sick this week but I think the fresh air was good for all of us! The tackle by the little brother! 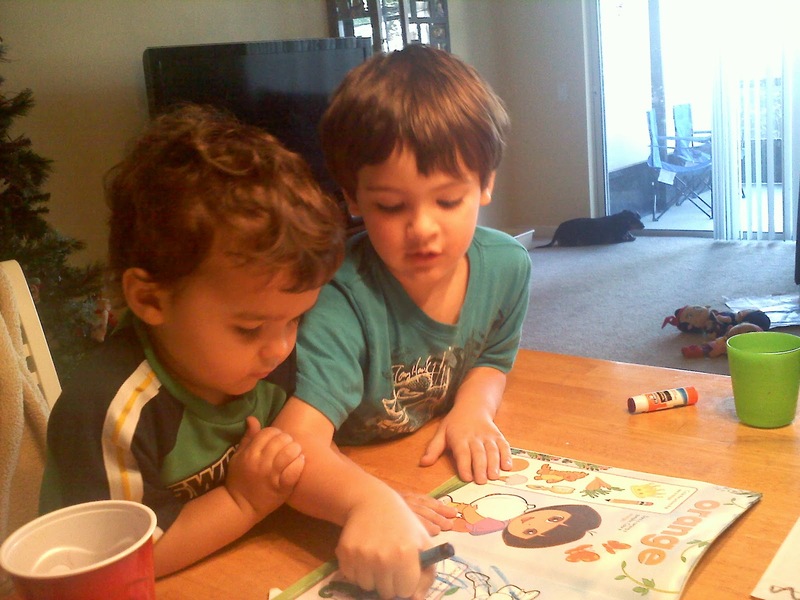 B helping his brother with his schoolwork. G had to circle the pictures that were green in his Dora booklet! Chapter 26 "Jesus' Sacrifice" in "The Story" - the last Supper Jesus died for our sins so we can live with Him in heaven someday. Introduction to #1 (B circled 1 fish for Mr. Potato Head booklet and found the 1 different shape (square) out of all the others (circles). We counted from 1 to 5 3 times on ABCmouse.com and B circled 2 clouds and chose the picture that had 2 items in it in his Mr. 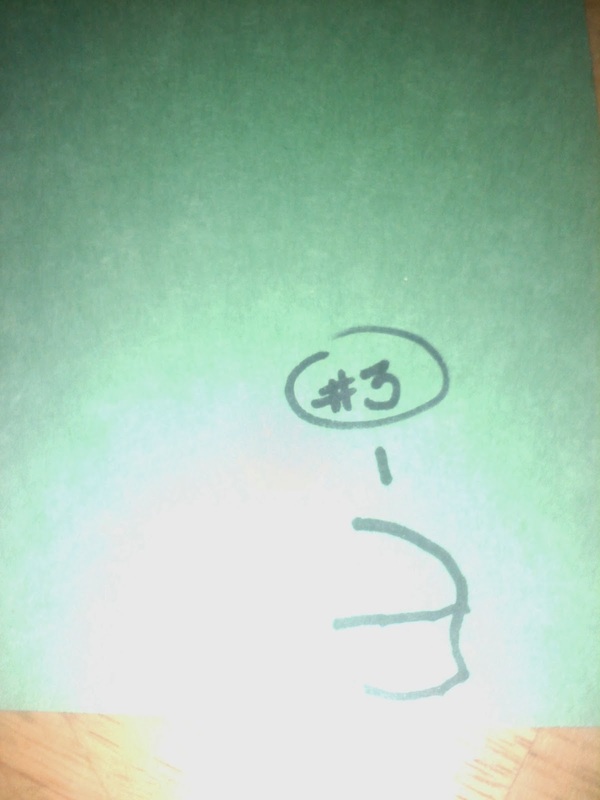 Potato Head math booklet. We also danced and sang songs from ABCmouse.com to the letter e song and the Alphabet song. We matched colors to the correct picture and had a review on primary colors (red, blue, yellow). They also have a new area where you have to feed, bathe and give your pet water so the boys are having fun taking care of their virtual pets! Until next week have a great one! 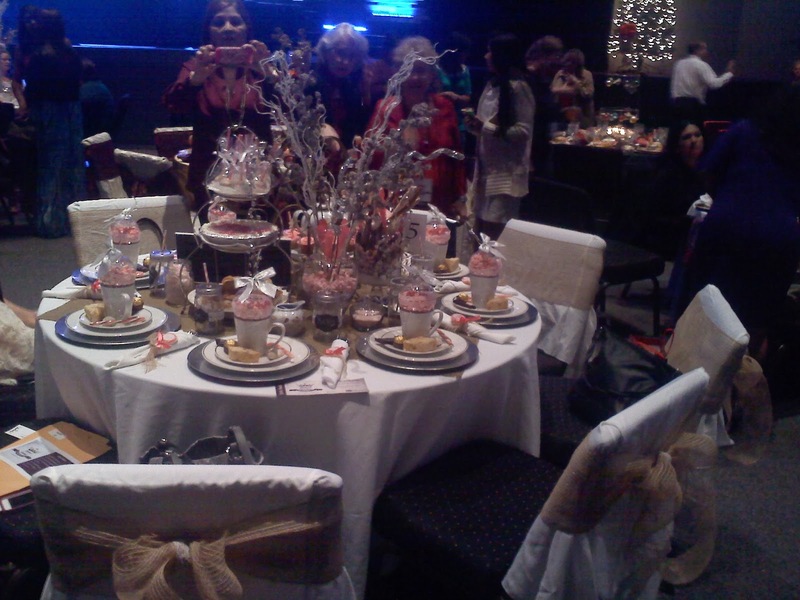 Last night I had a Benevolence Women's Coffee at my sister's church. 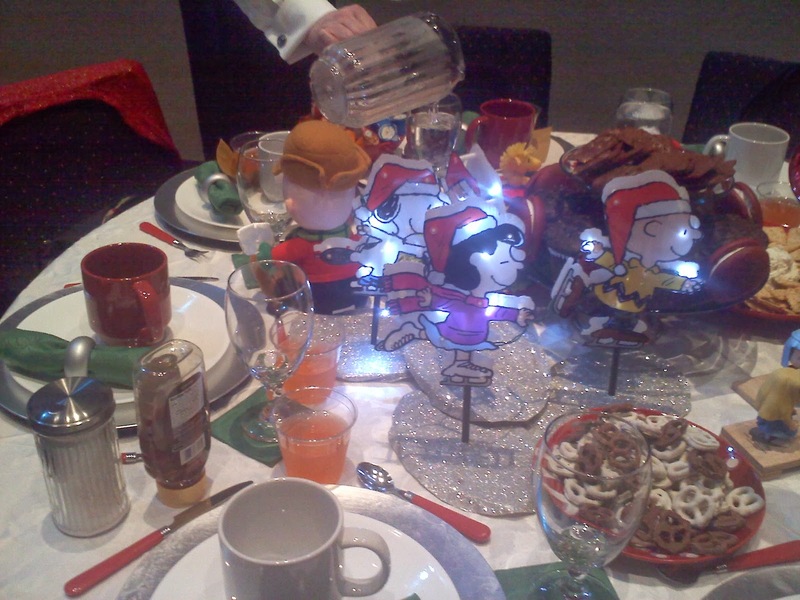 Her roommate was the hostess of the table and I was honored to have been invited and included in the festivities. Everyone did such a great job of coming together and helping each other and it was a beautiful event. There were Christmas carols sung and the Men's Ministry was there to serve the women. There was a red carpet when you came in and everyone was video recorded on the huge screen in the event as you entered so you really did feel like a VIP! The pastor's wife spoke at the end on being offended and how to handle it as a Christian. She said it was one thing to get offended by a non-believer of Christ, but when a family member offends you or someone who is a Christ believer offends you, it hurts more. Even worse, is a Christ believer who is a family member who hurts or offends you. She explained that Satan sets us up like an animal trap luring us in with the bait of getting angry or nasty and then the trap closes and we have landed right into his trap. Good analogy! It happens to the best of us. She quoted Luke 17:1 "Jesus said to his disciples, "Things that cause people to stumble are bound to come, but woe to anyone through whom they come." She said it is okay to honor your feelings but that we need to forgive and sometimes that is hard. Again, forgiveness being preached. This helped me out immensely. 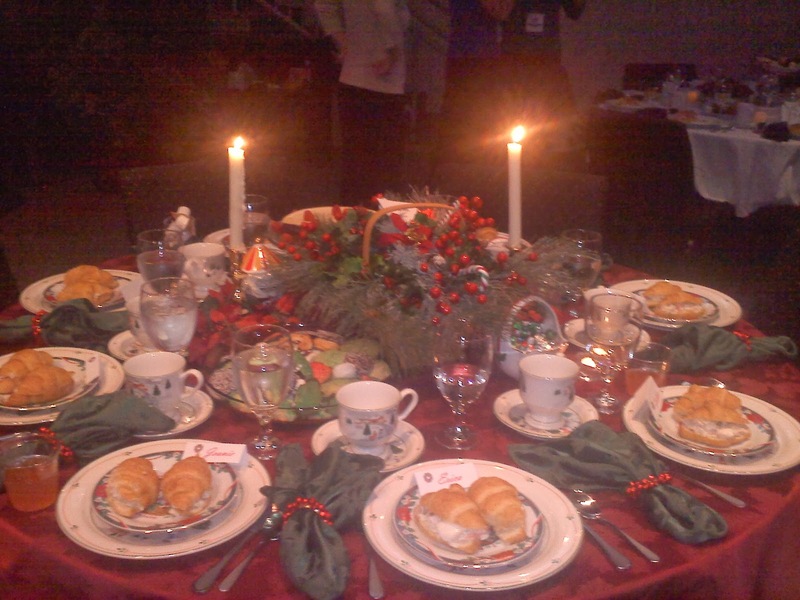 My plate setting at the table! It was like a wedding how elaborate everything was! 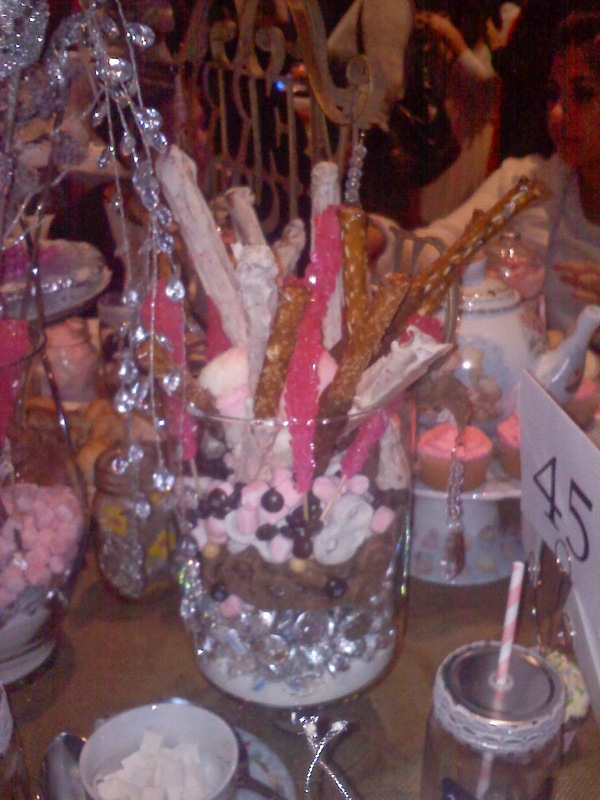 The centerpiece in the middle of the table - it was filled with pink marshmallows, pink rock candy, white and milk chocolate coated pretzels and pretzel sticks, M&M candies, and Hershey kisses piled on top of sugar! She even had goodie bags under our place setting so we were all able to bring some candy home! 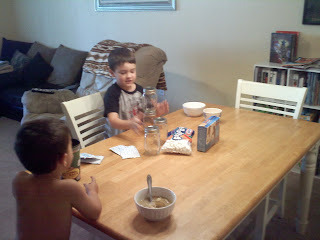 Needless to say, the boys were super excited this morning! 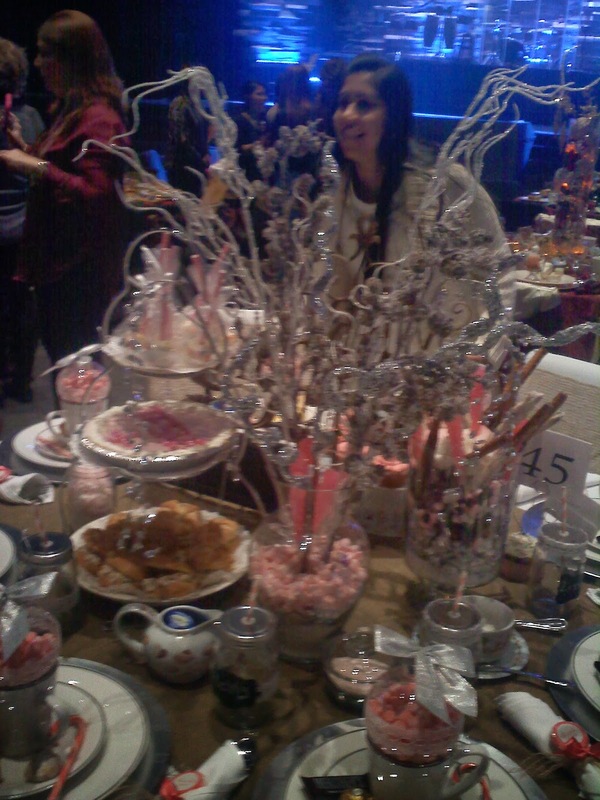 The theme was candy but she did it very elegantly. The chair backings! Attention was paid to every last detail! Yum! So pretty to display and fun to eat! 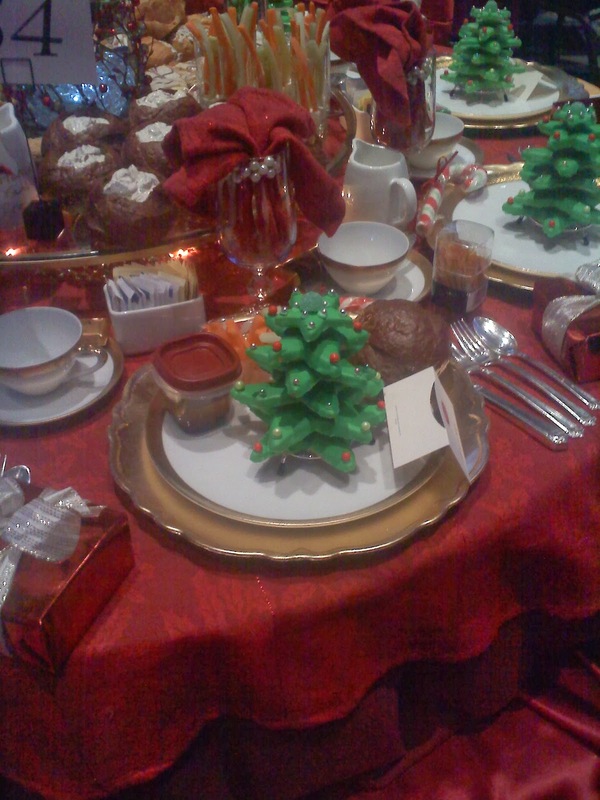 This was a different table but these are cookies piled on top of each other to make Christmas trees! How creative! 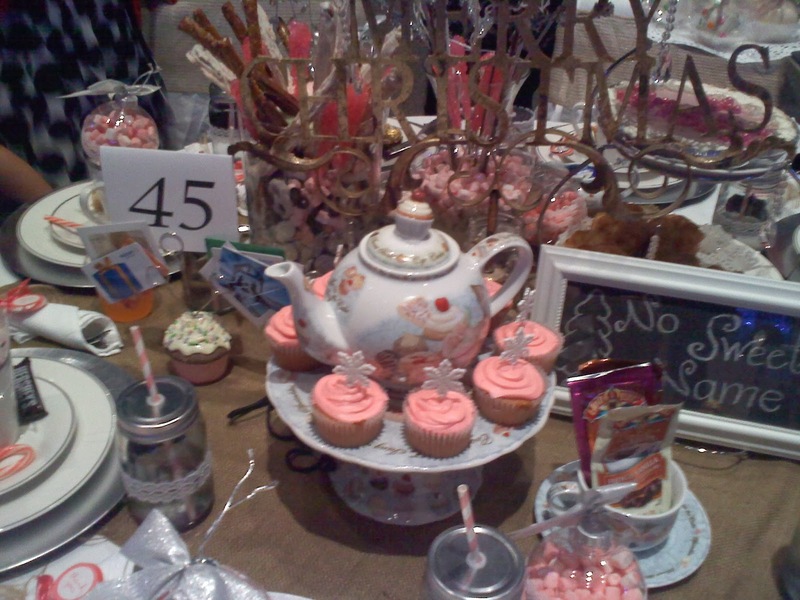 I loved this table! It was like a Christmas feast waiting for you! 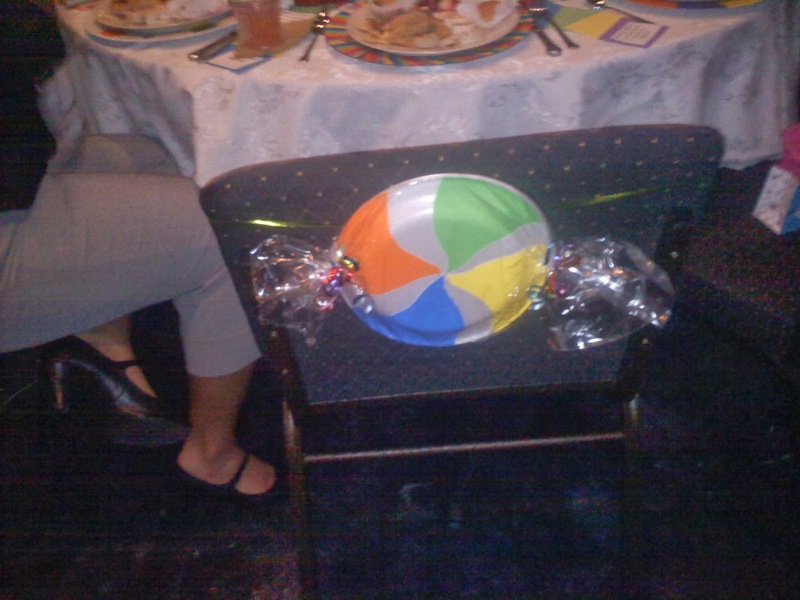 Had to take a picture of this table! 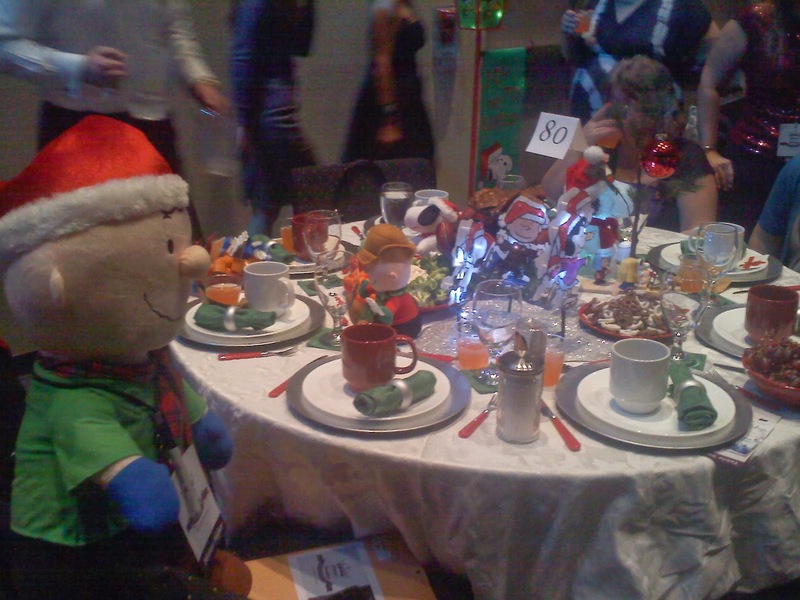 This would have been B's favorite table! 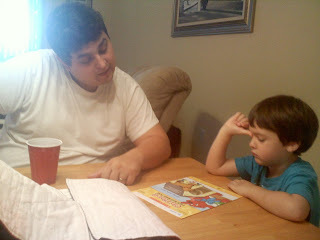 He loved me showing him the pictures! 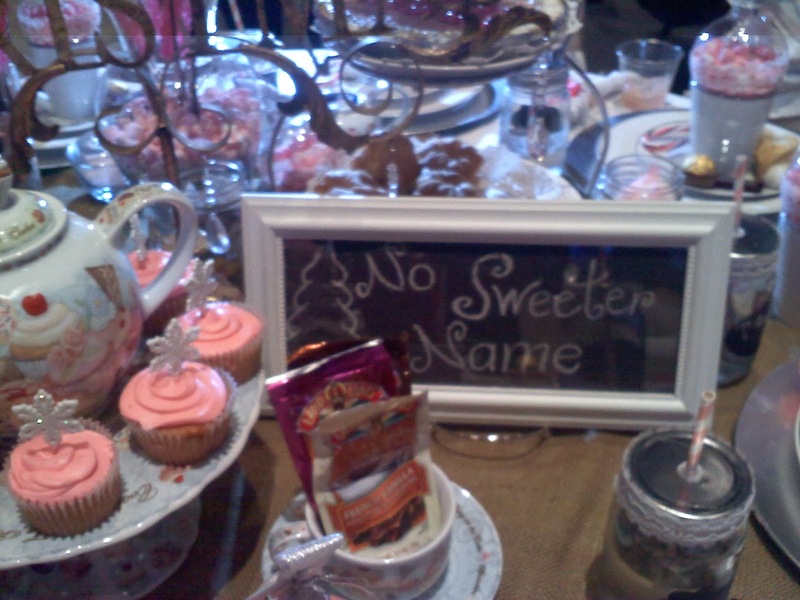 Another candy table but they did more of a Candy Land theme so this was the backings made out of paper plates! 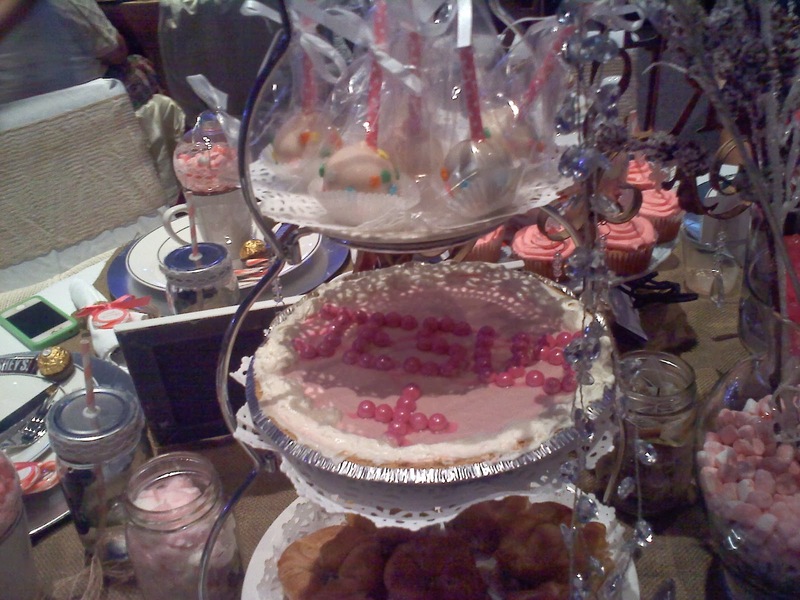 Someone made cake pops and then another person decorated a cheesecake with "Jesus" and a cross on it! Below are my chicken salad croissants that I made from a recipe from "The Pioneer Woman. (http://thepioneerwoman.com/cooking/2008/05/chicken-salad-the-way-i-like-it/)" Glad I got a picture because they were gone! Everyone thought it was catered and couldn't believe how delicious it was and that I made it at my house! 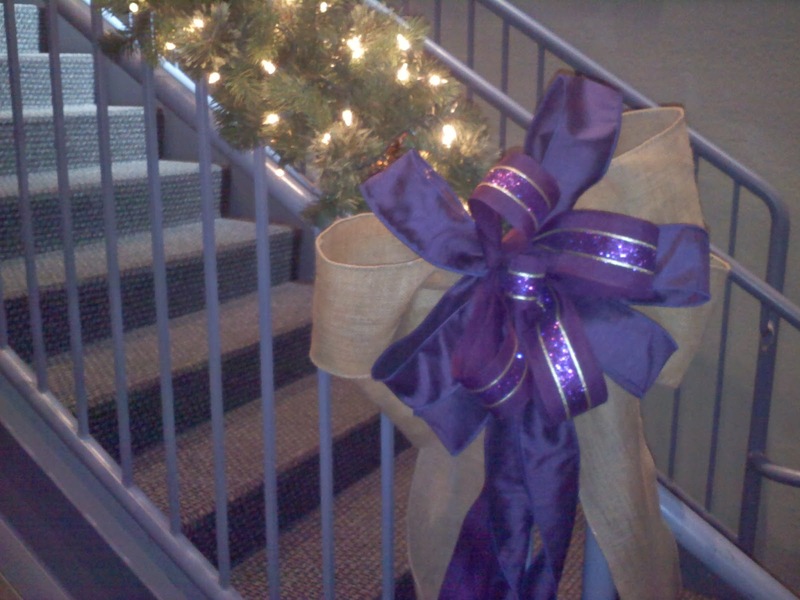 They had white Christmas lights going up the stairs and this gold and purple together was such a good color combo! 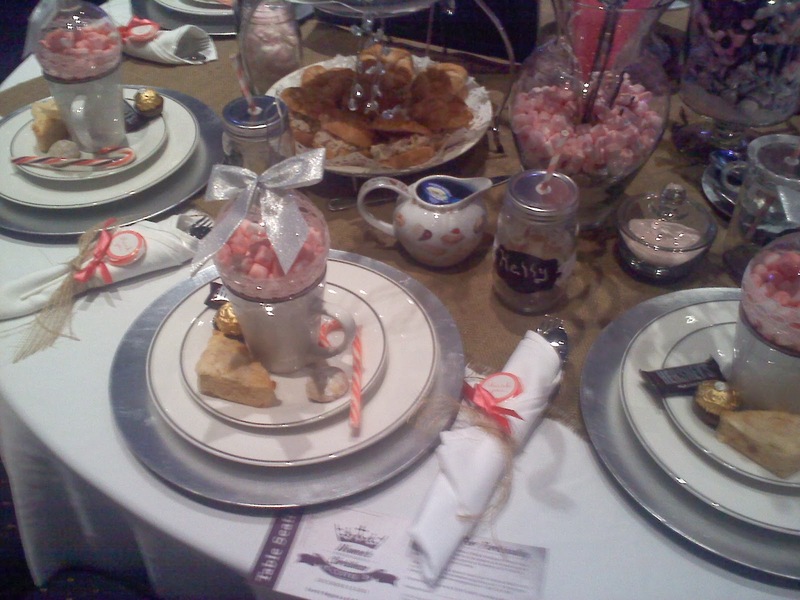 Everyone at the table made a dessert or food for the table but putting it all together was beautiful! 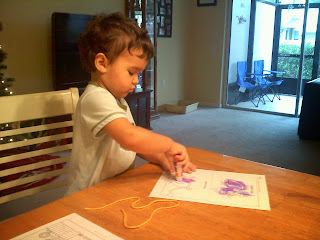 B had to cut and paste the yarn to follow dotted line paths where indicated, which was an awesome motor skills activity! We had a measurement lesson on what piece was longest, shortest, and the same size. We worked on a Clifford lesson with Daddy! B wrote words from the story (man, noodle, song, hug), picked out the letters to spell out "holiday," chose pictures that didn't belong in a certain group, and used rhyming to help him figure out the word. 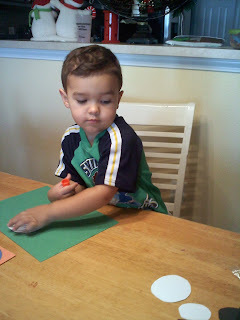 G named each color of the crayon he picked up to color and we all sang the "Alphabet Song." 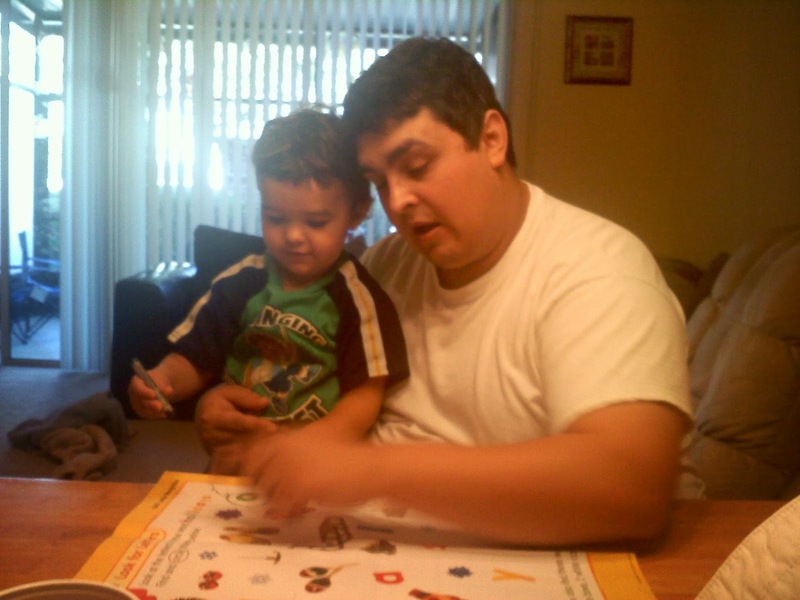 G and Daddy working on Clifford together. 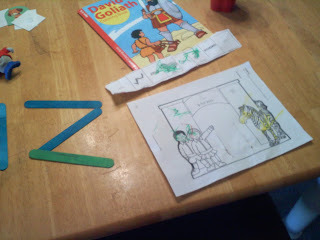 Letter Z for Zebra and Zoo booklet - color, cut and paste booklet with "Z" words. B also used popsicle sticks to make the letter "Z." Gamma left this week to go visit my brother and his family for Christmas but I got a cool picture of all of us out for a walk. Not too long after this, some kids showed up and the boys got to play football and run around with them for almost an hour! They had a blast! It's not December without Elf on the Shelf! 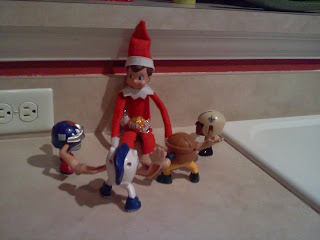 Here he is playing football with the toys and a piece of candy for the football! Naughty elf! 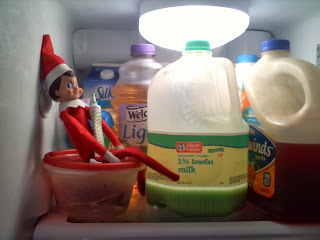 Turned the milk green but Googs loved "Elf Milk" as he called it! 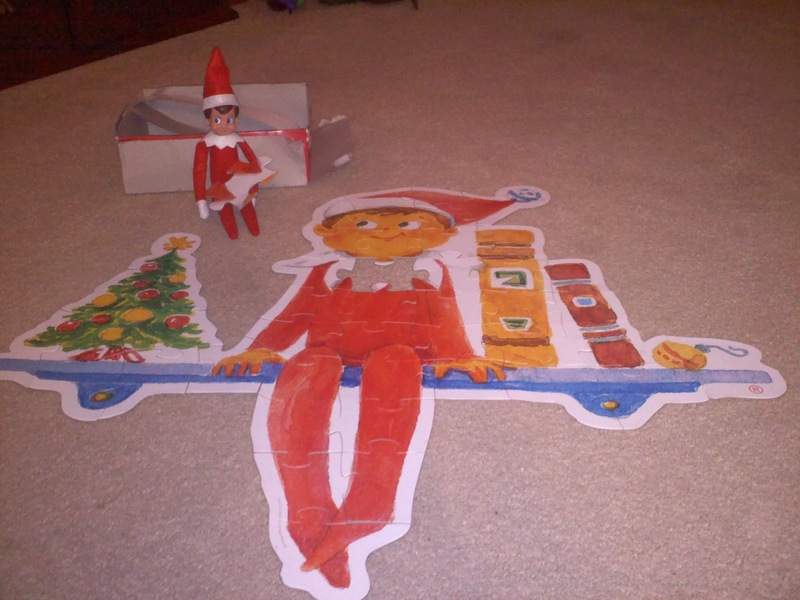 My Mom got a cool "Elf on the Shelf" puzzle for the boys so we caught our elf, Chippey one morning trying to put it together! Daddy and Mommy got a night out to talk to Santa about Christmas and for our anniversary that will be this Christmas! 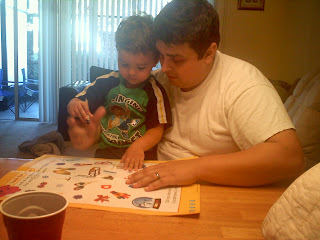 While we were out, the boys got a special night with just Grandma and Grandpa so they did puzzles and read books with them. 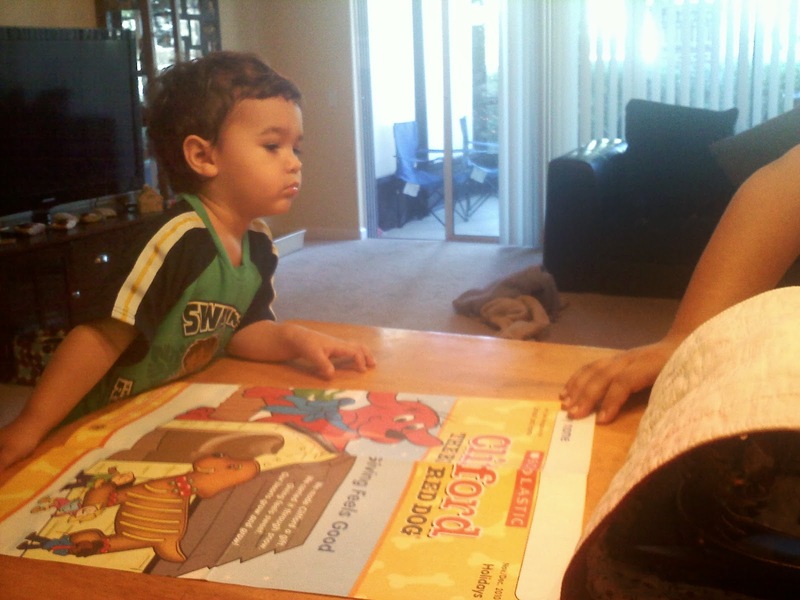 Chapter 18 in 100 Lessons - read Sam is mad at me and answered comprehension questions. Bible studies in "The Story:"
Chapter 24 "Jesus the Teacher" - Jesus telling the story of the good Samaritan helping the man who got robbed and about being a good neighbor, even after a priest and leader in the church passed by the man. Chapter 25 - " Jesus and the Little Children" - Jesus' disciples telling the children to let Jesus rest and Jesus saying that we should all enter the gates of heaven as innocent and childlike like the children. Good stories this week that even Momma needed to hear. It is good to be forgiving, even when people hurt you. Jesus gave us the ultimate sacrifice, his life so that we would be forgiven for our sins. I feel God has been reaching me through my emails lately! (made me think of the movie, Bruce Almighty lol) All of my email devotionals and lessons and stories this week were focused on forgiveness. This is a very hard concept for us because going through hurt makes us want to stay mad and not forgive but it is good to forgive and that is what the lesson is for this week from God I feel.